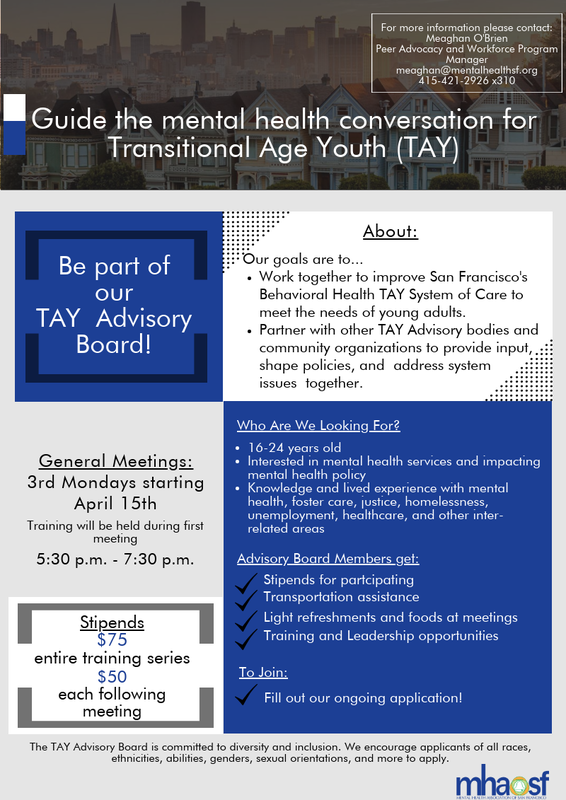 -Work together to improve San Francisco's Behavioral Health TAY System of Care to meet the needs of young adults. -Partner with other Youth Advisory bodies and community organizations to provide input, shape policies, and address system issues together. The Youth Advisory Board is committed to diversity and inclusion. We encourage applicants of all races, ethnicities, abilities, genders, sexual orientations, and more to apply. The Youth Advisory Board is a collaborative project with the San Francisco Department of Public Health. This program is funded by the TAY System of Care (SOC) grant where Behavioral Health Services (BHS) help to support, provide, and coordinate culturally developmentally responsive behavioral health services.